The Salt Potatoes being presented before the Wild Carp Week World Salt Potato Eating Championship on Paper Mill Island Budweiser Amphitheater stage in Baldwinsville, New York. One tin of salt potatoes weighed 3 pounds. With all the pomp and circumstance of a World Wrestling Entertainment (WWE) bout, Major League Eating came to my town of Baldwinsville, New York last weekend for the first ever Salt Potato Eating Championship. In the past I have mentioned salt potatoes, a favorite summer delicacy of Upstate New Yorkers. The 3 pound tins of salt potatoes were presented by a few local lovelies picked by the barker, I mean emcee of the event, Major League Eating President George Shea with perfect pitch and music to accompany them. The top competitive eaters in the world were brought in to see how many pounds (yes, I said pounds) of salt potatoes they could eat in 10 minutes to kick off the Wild Carp Week tournament festivities. Many had colorful names fitting the lavish introductions Mr. Shea barked out before the start of the event. Humble Bob Shoudt, Pat “Deep Dish” Bertoletti and the Number 1 competitive eater in the world and current Nathan’s Hot Dog eating champion, Joey “Jaws” Chestnut, each strutted onto the Budweiser Amphitheater stage on Paper Mill Island each time Shea started up a new music track and string of over the top adjectives to describe their past eating exploits. Emcee and Major League Eating President George Shea doing his WWE style introductions of the competitors in the Wild Carp Week World Salt Potato Eating Championship on Paper Mill Island Budweiser Amphitheater stage in Baldwinsville, New York. Nikon D700/28-300VR, 1/125s, f/5.6, ISO 400, EV +0.3, 180mm focal length. Each competitive eater had various kinds of drinks and juices which they laid out in front of them. It was interesting to see them get ready for their competition as the crowd counted down to the start. To think of this as a sport seems silly but, to these guys and gal, it was serious business which pays the best eaters over $200 thousand a year. Joey Chestnut stuffing salt potatoes into his mouth during the Wild Carp Week World Salt Potato Eating Championship on Paper Mill Island Budweiser Amphitheater stage in Baldwinsville, New York. Nikon D700/28-300VR, 1/125s, f/5.6, ISO 360, EV +0.3, 300mm focal length. As the competitors entered the last minute of the competition, it was clear it was coming down to Pat Bertoletti, the number 2 competitive eater in the world, and Joey Chestnut. Each kept loading up their mouths full of salt potatoes. Joey was jumping up and down to help get the salty, butter covered smashed potatoes down into his stomach. Pat spewed his red Kool-Aid drink to help get his down. 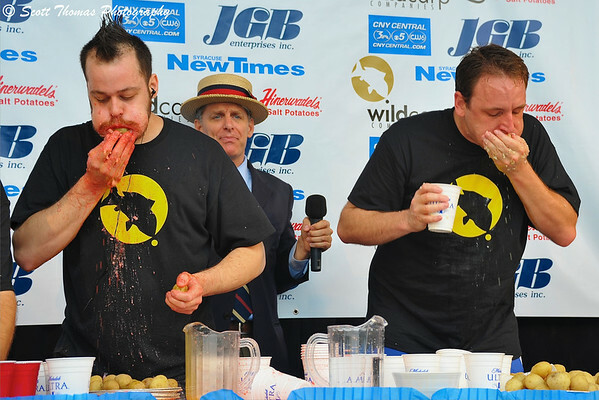 Pat Bertoletti (left) and Joey Chestnut (right) during the last minute of the Wild Carp Week World Salt Potato Eating Championship on Paper Mill Island Budweiser Amphitheater stage in Baldwinsville, New York. Nikon D700/28-300VR, 1/125s, f/5.6, ISO 200, EV +0.3, 82mm focal length. Promoter Jason Bernhardt: raises Wild Carp Week World Salt Potato Eating Champion and World Record Salt Potato Eating holder Joey Chestnut's arm in victory on Paper Mill Island Budweiser Amphitheater stage in Baldwinsville, New York. Joey ate 13 pounds of salt potatoes in 10 minutes to set a new world's record. Nikon D700/28-300VR, 1/125s, f/4.5, ISO 200, EV +0.3, 35mm focal length. 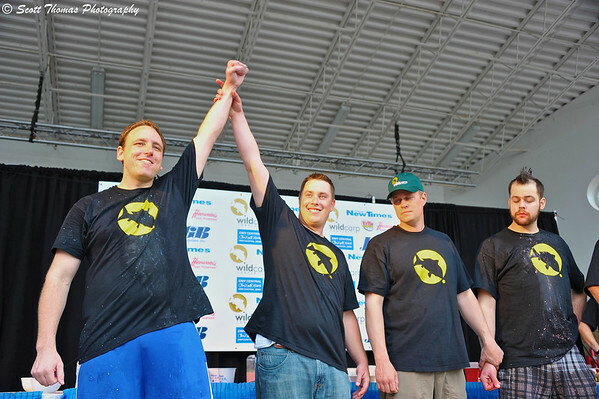 Joey Chestnut by eating 13 pounds in 10 minutes! That is two bags of salt potatoes and more than half of another. In contrast, I eat maybe a half dozen at a time. I guess the $5,000 first prize will help Joey to digest it all. In total, the competitors ate over 100 pounds of salt potatoes. Yum…yum! This entry was posted in People, Weekly View and tagged amphitheater, baldwinsville, barker, budweiser, butter, competition, competitive, contest, eating, emcee, george shea, ifoce, international federation of competitive eating, jaws, joey chestnut, major league eating, mle, new york, paper mill island, salt potatoes, stage, world record. Bookmark the permalink. Very interesting post . . . and seriously whacked out culture we live in, isn’t it? I think a nice little dish of salt potatoes sounds really good. I’ll bet that lovely young woman in the first picture doesn’t eat ’em pounds at a time. I want to be like her when I grow up. Gerry, there was one woman contestant who only weighed 100 pounds. She is ranked 10th in the world of competitive eating. She finished in 6th place and ate over 6 pounds of salt potatoes. So, one does not need to be a big person to compete in this “sport”. Oh my…makes me ill looking at them doing that! 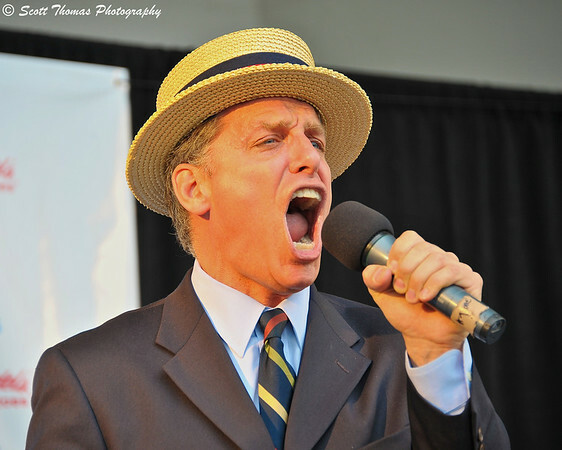 Great shot of the EmCee, I wonder how many he could put in that mouth! What an event! I have not ever heard of Salt Potatoes before. Not surprising, Kat. Salt potatoes are one of those regional foods found only in the upstate NY area. If you are ever passing through Buffalo, Rochester, Syracuse or Albany, be sure to ask for them. I have also heard the Dinosaur BBQ in New York City has it on the menu, too. Okay, this post begs the question, what exactly is a salt potato? Is it a particular type of potato? How is it prepared? I was surprised to find salt potatoes are not served on Cape Cod as they are a staple of clam bakes in central NY. Here’s more info via Wikipedia: What are Salt Potatoes? Wow that’s a lot of salt! You should enter next year, I’ll come and take pictures. Deal! See you next year! I cannot imagine trying to do that. I am more likely to win at slow-eating contests. Great captures, Scott. Your pictures tell the story well. Thank you, Robin. It was a fun story to tell. Salt potatoes? Never heard of it before. If they taste good – they might be enjoyed slowly in small bites instead?! Oh, they are enjoyed that way. Not sure these people actually enjoyed any of this. Though the winner said he did like them. And this is a sport, kind of a strange concept to me. The second to the last image made me sick just looking at them. It is strange indeed but goes back centuries. They now take it to the extreme. Sorry, I held back on some of the really disgusting ones. Great post Scott…I couldn’t even imagine devouring that much food, let alone for time !!!! It is a strange sport, but you did such a great job covering the event! All I could think of is “carb overload, carb overload!” I bet they had to take a long nap after ingesting that many potatoes! 🙂 I love me some potatoes!